“Government communications” legal information is like product information from the manufacturer. Independent PLEI is like product information from a third party product reviewer. Both can be helpful, both can be wrong, both can be biased. Today, I want to tackle the rest of this issue: first, whether government can make real PLEI, distinct from “communications”; and then, how we might reduce the confusion and debate around this topic. Can we make a meaningful distinction between different types of legal information that the government produces? That is, is there real government PLEI that’s not government “communications”? Plus, Moliner noted the further problem that community organizations and the public are often more skeptical of government PLEI than of non-government PLEI. Altogether, I think this shows that while the differences between communications, government PLEI, and independent PLEI may fall across a continuum, there are significant disadvantages to government-produced legal information and PLEI programming. Moliner, in fact, recommended in her report that Justice Canada cease all internal PLEI production and adopt a policy of contracting all PLEI work to independent organizations. To get some insight into solving this issue, we ought to look to the UK, where a national task force is currently trying to come up with a sturdy national strategy for PLE. These observations from the UK, especially when combined with the Moliner review’s recommendations, strongly suggest that we should favor independent PLEI over government PLEI. But even if we establish a formal preference for independent PLEI, the government will never be able to avoid (or resist) disseminating legal information to the public. How do we delineate roles? The information here is government issued legal information. It represents the government’s interpretation of the law and is not intended as practical assistance. For practical information and education about legal issues, appropriate for your area, contact a public legal education organization. If you need personalized legal advice, call a lawyer or legal aid agency. Is this a good start? Or would this never work? Is government capable of producing PLEI that’s not also “communications”? How can we eliminate the confusion and end the debate? Today, I’ll tackle the first question. Tomorrow, I’ll work on the other two. Government communications provide “information about a law without criticism or advice,” are “necessarily seen as reflecting the perspective of the government” and are “conveyed in terms approved by the [Government]”. I think these definitions work for highlighting the difference. At their essence, I think they tell us that while government communications are promotional and tow the official line, PLEI materials are practical and tow whatever line they want. Tomorrow: whether there is any such thing as “government PLEI” and how we can sort this whole mess out. “Law-related education” (LRE) has come to be the term for PLE in schools. Although you wouldn’t know that from the phrase itself, the term originally came from the United States. In the States, the schools component of PLE has always been the forefront of the field, and the term “public legal education” has not (yet) become pervasive. In this way, Canada and the U.S. have had opposite PLE experiences. While in the States, PLE has been mostly LRE and the driving force has often been the field of education, in Canada, LRE has remained a smaller part of a larger PLE movement driven primarily by government and the legal profession. Increasingly, there is a trend to concentrate, or even to limit, the provision of public legal education to students, specifically high school students. What of the person on the street, however; the person never blessed with a high school course on the law, or whose law course is ten years in the past? Is teaching law to high school students the primary goal of public legal education or are broader goals warranted, encompassing the provision of information on the law and legal system to the general public? What is the proper role for LRE (that is, schools-based PLE)? Has LRE “unraveled” in Canada? If so, how should it be put back together? Would the American system, where LRE is at the center of the PLE movement, be better? I’ve received a notable amount of appreciation for my post compiling links to internet-based PLE projects. I’d like to continue to help in this way. Because I’ve just been all across the country to learn about ongoing projects, I could easily put together more “nationwide roundup” lists. So, I’m taking requests. If you’d like to request a topic—say, Aboriginal-oriented programming, or radio-based projects, or schools programs—leave a comment or send me an email. Although I can’t guarantee I can always assemble comprehensive lists, there’s a good chance that if I leave someone out they’ll correct me. It’s 1987, and it is a watershed year for public legal education in Canada. Infused with federal interest and dollars, the movement is on the verge of “completing the network”: there is now a sole-purpose PLE organization in every province and territory except New Brunswick. Justice Canada’s core funding commitment has just jumped from a $60,000 to a $70,000 minimum annual commitment per organization. A bunch of PLE organizations have gotten together to form a national umbrella organization, the Public Legal Education Association of Canada. The artifacts of Canadian PLE brim with hope and vigor. After fifteen years of creating the field out of nothing, pulling it up by its bootstraps, and dragging it into a skeptical and sometimes hostile world, the pioneers of PLE are beginning to see the light, and it is good. Considering the great promise of that year, I thought I ought to use this blog to leave a little window open into 1987. To do that, I’m posting a “Survey of Public Legal Education in Canada” from 1987, compiled by Suzan Hebditch and published that year in the Canadian Association of Law Librares Newsletter/Bulletin. PLE researchers and anybody currently involved with a sole-purpose PLE organization will likely be interested in taking a look. Here it is [1 MB PDF]. 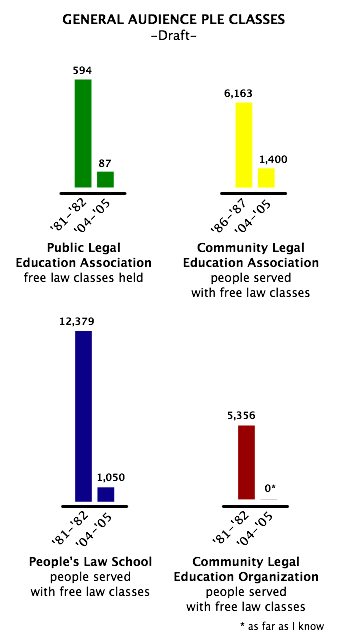 When PLE first got really rolling in Canada, the “free law class” was a definitive part of it. In fact, the very first sole-purpose PLE organization in Canada—the People’s Law School—got its start providing nothing but free law classes. The Toronto Community Law Program (now CLEO) got started soon after that, with the same idea: hold classes on legal topics and invite all of the public, at no charge. As other sole-purpose PLE outfits came on the scene, many put free law classes at the center of their programming as well. That prominence has all but disappeared now. In the mid-1980s, CLEO all but scrapped its free law class program and is now an organization that devotes nearly all of its energy to producing and distributing print publications. The People’s Law School did a review of its programming in the 1990s and decided to refocus its efforts away the free law classes, although that program continues in speakers’ bureau form. In every other sole-purpose PLE organization that has taken up the free law class format, you can chart a significant decline in the number of classes offered as time has worn on. Most class-format PLE work by sole-purpose PLE groups seems now to be workshops and training for intermediaries. Few offer classes for the general public, and most of those that do offer them only irregularly. Yet, other PLE providers—especially legal aid organizations—have kept free law classes at the core of their PLE efforts. Why is this? Is this the result of a gradual negotiation of expertise between sole-purpose and non-sole-purpose PLE providers over the years? Did the free law class delivery strategy prove ineffective? Was it too costly? I actually have some answers to these questions, but I will have to wait to disclose them in a formal article and after tending to my research ethics obligations. In the meantime, I would be interested to hear what those involved have to say about the disappearance of the free law class from independent PLE. I’ve had a fascinating afternoon working up a short section, for a longer article, about the historical roots of public legal education. Though these roots may go back even further, we can trace them at least as far back as Ancient Greece and the origins of promulgation. If there were a list of “world heritage of PLE” sites, the Monument of the Eponymous Heroes would be on it. At this monument, in the agora (Athens’s central forum and marketplace), the legislators (Nomothetai) would publish all new enacted legislation for the public to see. Also, any citizen could propose new legislation by posting it at the Monument. On the above illustration of the Monument, you can see spaces below the ledge that the statues rest on. These spaces were where the new laws and proposed legislation would hang—the ledge protected postings from the weather. It was a crime to modify or vandalize the inscriptions, and the Senate appointed special officers (Grammateiz) to ensure the postings stayed legible. Certain laws were also inscribed in stone in the Stoa Basileios, also in the agora. The commitment to popular promulgation was taken up in Ancient Rome as well, where all laws had to be made known in “clear letters” and in a place where people would be able to see them. The despotic emperor Caligula famously perverted this requirement by inscribing the laws at the top of buildings in small characters, and then collecting money from citizens who violated laws they never knew about. I set out today to write an entry on public legal education for the blind. I have to report, however, that I’ve found almost nothing on this topic. Statistics Canada reports that there were nearly 600,000 Canadians with a “seeing disability” in 2001. Several sole-purpose and major PLE providers produce audio (and audio-visual materials)—distributed over the radio, the internet, and on videocassettes and DVDs—and a couple produce print materials with extra large type. In the late 1970s, the People’s Law School recorded a number of their publications as “talking books” and distributed them at free law classes about the rights of blind people. But in my travels, although several staff have mentioned a need for materials and access specially for the blind, I have not heard of any contemporary project that is actively targeted at the visually impaired. Please correct me if I’m wrong. Of course, many visually impaired people use the web extensively, with the help of screen readers and other accessibility devices. I have not heard of any major Canadian PLE organization validating the accessibility of its website, or providing content related to legal issues that visually disabled people face. There are tools, including the free Watchfire WebXACT, for checking the accessibility of any website. Research and centres also provide tips on web accessibility, and I should note that I did find a policy on accessible web content on PovNet. Again, please leave a comment if you know of programs that I have not heard of or am not thinking of. UPDATE: CLEO and CLEONet have dealt thoroughly with accessibility issues. See CLEONet’s page on web accessibility, its checklist for compliance with accessibility standards, and CLEONet Project Manager Fiona MacCool’s and CLEO Clear Langauge Editor Kim McCutcheon’s comments below. UPDATE 2: The LSS Family Law website is also accessible for vision-impaired web users. See Thom Quine’s comment below. UPDATE 3: Éducaloi has begun adding audio to some of its “infosheets,” an addition specifically targeted at the blind. See Philippe Miquel’s comment below. Are the blind and their legal issues not showing up in PLE needs assessments? Does more work and effort need to given to this area? What strategies could be used to reach this group? Last week, I wrote about how to describe the PLE program planning process and how funders’ demands co-opt that process and possibly undermine the expertise of PLE organizations. To recap, I proposed distilling PLE program development into discrete steps (needs assessment, design, development, delivery, and evaluation, perhaps) and then noted how some project funding will force a particular need, design, and even development method onto a grantee. And when the funder also requires unhelpful evaluation, the PLE organization becomes merely a delivery mechanism for the funder’s own message. But rethinking what “program planning” really is could lessen this project funding co-optation effect. So says a creative 1994 article called The Politics of Responsibility: A Theory of Program Planning Practice for Adult Education, by Ronald M. Cervero and Arthur L. Wilson. Those authors say this: stop pretending. Stop pretending that the impact of politics, funding, and power are just “noise” or “context” in the program planning process. Realize, instead, that education programs are planned by real people working in complex organizations and dealing with power relations and interests that are pushing and pulling at the developing program from all sides. In other words, education programming is like cuisine: how it tastes will reflect the culture it was made in—unless the chefs were conscious of their culture and looked outside of it for inspiration. Power: power is capacity to act, and the players in just a single program (the PLE organization, the funder, the target group, the rest of society, and so on) will have different capacities for influence on the program. Planners must realize this, the authors say. Interests: these are the values, desires, expectations, and goals of each player—interests are what the players use their power for. We might also call them “motivations,” and planners must be aware of them, too. Negotiation: this is the characteristic activity of program planning, Cervero and Wilson argue. Using the power they have, planners negotiate with their own interests and between the interests of the other players involved, ultimately agreeing on and producing a PLE program. Yet, all along, planners are also negotiating about the power and the interests that they have; doing certain programs, or doing them in certain ways, can improve or endanger the relationships the planner has with the other players. For PLE, it may be good to also include funders, government, and the legal profession in that list. Some PLE organizations, I can report, already follow a version of this “democratized” planning process, though perhaps not with the awareness of power, interests, negotiation, and responsibility that Cervero and Wilson recommend. First, let me introduce Craigslist: it’s a twelve-year-old collection of city-based websites featuring free classified ads and discussion forums. It is one of the top fifty most viewed websites in the world, the 16th most popular in Canada, and in the top ten in the U.S. Among Craigslist’s roughly 100 forums is the Legal Forum. Viewing the Legal Forum by city—say Edmonton, for example—gives you a window on (A) the legal needs of Craigslist users in a particular area and (B) just how frightening the public’s understanding of basic, practical law can be. Complicating everything, of course, is that many of those who answer legal questions on the Forum are both quite confident of their answer and astoundingly, harmfully wrong. Even so, there are probably as many truly helpful responses in the forum as their are harmful ones. Another notable site is the eleven-year-old LawGuru. Rather than letting anyone in the world anonymously answer legal questions, LawGuru limits the answering to its “attorney network of over 5,000 attorneys in 35 countries.” Anyone can ask a question for free, and each answer has the name and contact information of the lawyer who wrote it. LawGuru gets considerable traffic from Canada, and like the Craigslist Legal Forum, it offers an insight into the general legal needs of people with web access. The obvious question is how PLE organizations might learn from or interact with these sites. For one thing, are Craigslist’s Legal Forum and LawGuru two of the main places web users go to solve their legal problems? And if so, should PLE organizations inject themselves somehow into those sites? Or should they collaborate with those sites? Replicate them? Ignore them? Neither of these sites has ever come up in my discussions with PLE providers throughout the country—are they not on anybody’s radar?